Growing up in Illinois, Dr. Nathan Terry attended Salem Community High School where he graduated with honors and received many basketball awards and accolades. After high school he attended Kaskaskia College in Centralia, Illinois obtaining a degree in Biology. Following graduation Dr.Terry shadowed several chiropractors and other health care professionals. The chiropractic scene was the only place that people were routinely improving, looking forward to their appointments, receiving their quality of life back, and not dreading the run around taking more medicine to treat their symptoms. Shadowing genuinely increased his passion and drive for chiropractic care. After receiving his undergraduate degree, Dr. Terry attended Logan College of Chiropractic in Chesterfield, Missouri. While at Logan, he attained his Bachelor's degree in Human Biology, became a regular on the Dean's List, worked as a Student Intern Assistant to help other students in the field of Chiropractic, and was awarded with the Chiropractic Research Project of the Year. Dr. Terry graduated with his Doctor of Chiropractic in April 2012. In his spare time Dr. Terry enjoys spending time with his dogs Callie and Gus, spending time with family and friends, meeting new people, playing golf, fishing and watching sports. Dr. Terry also enjoys getting outdoors and watching St. Louis Cardinals Baseball. 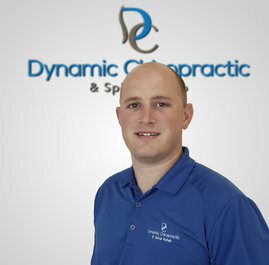 He is truly honored to be a part of the team at Dynamic Chiropractic & Spinal Rehab and continue providing the best chiropractic care to all the patients in the surrounding area.